What gave us Donald Trump is what gave us Dylann Roof. Donald Trump did not cause Dylann Roof. But there are clear thematic connections between the two. Photo illustration by Slate. Photos by Drew Angerer/Getty Images, Grace Beahm-Pool/Getty Images. On June 16, 2015, Donald Trump took the stage at his eponymous tower in New York City and announced his bid for the White House. His message was clear. “The U.S. has become a dumping ground for everyone else’s problems,” Trump said. A day later, in South Carolina, 21-year-old Dylann Roof walked into Emanuel African Methodist Episcopal Church in Charleston, where members were holding Bible study. Using a .45-caliber Glock handgun and eight magazines of ammunition, Roof shot and killed nine people, including the pastor, the Rev. Clementa Pinckney, who was also a state senator. Before he arrived at the church, Roof posted a manifesto on his website, a racist tirade that expressed his motives. His message was also clear. “Integration has done nothing but bring Whites down to level of brute animals,” wrote Roof. Indeed, when read together, Trump’s announcement and Roof’s manifesto offer a duet in racial grievance. Trump wanted to “make America great again,” where “America” was a metonym for a traditional, industrial, and white America, set against a rising tide of racial threats, from Hispanic immigrants and black protesters, to Muslim refugees and the specter of “radical Islamic terrorism.” With this promise to restore the moral, cultural, and political dominance of that white America, Trump grabbed the reins of the Republican Party and never let go. Roof, in his own telling, wanted to awaken white America to the alleged threat of blacks and other nonwhites. “We have no skinheads, no real KKK, no one doing anything but talking on the internet,” he wrote. “Well someone has to have the bravery to take it to the real world, and I guess that has to be me.” I alone can fix it. These ideas were once marginal. But in the past year, they’ve been pulled into the mainstream by Trump and his presidential campaign. Trump has broadcast racial propaganda and anti-Semitic messages; his children have shared racist memes and reached out to white supremacist personalities. His campaign chairman Stephen Bannon, now chief strategist to Trump, pushed these narratives as CEO of Breitbart, a website where “black crime” gets a vertical and whose most famous writers lead online mobs of neo-Nazis and white supremacists. In the world of Bannon and Breitbart, white America is under siege by dark-skinned people and their white liberal enablers. Likewise, Roof’s manifesto reveals a belief system in which white America needs defenders from black criminals and other racialized threats. By his own account, Roof was radicalized by the killing of Trayvon Martin and the trial of George Zimmerman. He believed Martin attacked Zimmerman in an instance of “black-on-white crime.” Here’s what Breitbart published on Martin’s death and the trial: a “breaking news” story claiming Martin had drugs “in his system,” a witness account claiming that Martin had attacked Zimmerman “MMA-style,” and an op-ed denouncing President Obama as a “race-baiter” for sympathizing with Martin. In the past year, the website has alleged that outlets such as YouTube censor videos of “black-on-white” crime. Trump did not cause Roof. But their temporal proximity reveals thematic connections between the two. Trump, the self-proclaimed billionaire, who blames immigrants and Muslims for America’s problems. Roof, the struggling young man, who blames black Americans (and others) for his stagnation. And if Trump embodies a white reaction to perceived decline in a changing world, then Roof represents that backlash in its most extreme and virulent form. Both Roof’s violence and Trump’s demagoguery flow from a shared swamp of resentment. The same white nationalists who led Roof down a path of hate and evil now gather in Washington, D.C., to celebrate the election of Trump as a triumph for their movement. 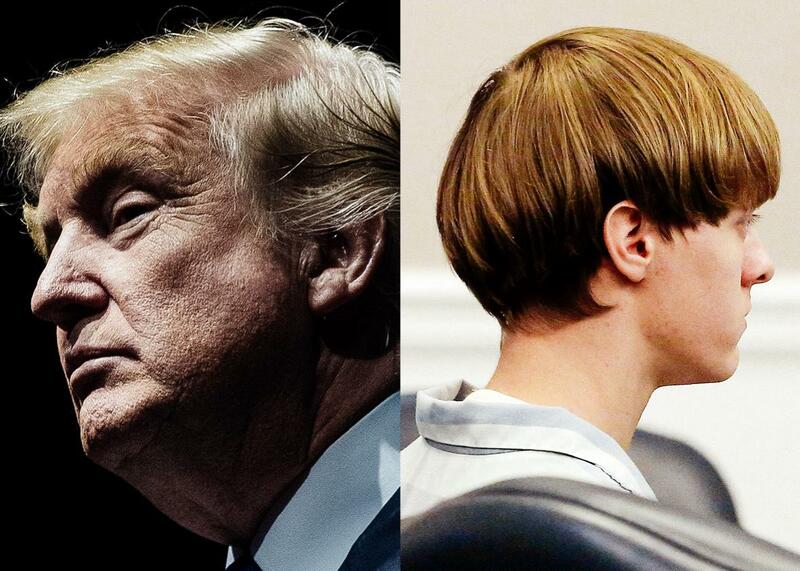 Roof’s crime is so monstrous that it may rankle to put him on the same continuum as Trump. But to see both with clear eyes is to see the link between demonization and aggression, between Trump’s rhetoric, simmering with menace, and the wave of harassment, intimidation, and outright violence that followed his victory. It’s to see both Donald Trump and Dylann Roof as heralds of the darkest forces in American life, to see their common heritage in a rising tide of white identity and white nationalism. Then, just 16 months and a few days later, we gave Donald Trump the White House. We didn’t avoid the mistakes of the past; we swerved in their path. We didn’t break the cycle; we strengthened it. Some of the same people who united around the Charleston Nine cast a ballot for the man who demanded murder for the Central Park Five. Seduced by demagoguery and the promise of new benefits and restored status, millions of Americans rejected the racial egalitarianism of Obama’s “more perfect union” in favor of a renewed color caste. The painful truth is that Obama’s optimism was misplaced. Yes, Roof will face justice. But the ideas that radicalized him will thrive, not just as an amorphous force in American life, but as an active presence in American politics. They will thrive in the West Wing. They will thrive from the Oval Office. They will thrive in rebuke to Barack Obama himself, what he stands for, what he means.